One of my very first advertisers here at Heavenly Homemakers was Paula’s Bread. She has been one of the coolest people to work with and our working relationship was perfect from the beginning seeing as I blogged about grinding my own flour – and she provided grain mills! For years and years we worked together. Her generosity is incredible and always, her customer support for you has been spectacular. I know many of you purchased your very own Nutrimill through her! A lot of loaves of bread have been baked for all of our Heavenly Homemakers families, thanks to Paula. She’s even given a few Nutrimills away through the years. So as we approached our 10-year mark here, I emailed to ask if she’d be willing to offer just one more giveaway for old-times sake. Of course she said yes. She gladly said yes. She’d probably send a free Nutrimill to every single one of you, but a girl’s got to make a living, and she deserves every penny of hers. Paula is awesome and generous and we can all thank her for her willingness to send one of you a brand new Nutrimill off her shelves! If you’re planning to buy yourself a Nutrimill or ask for one for Christmas, please support Paula’s Bread. Her prices are always competitive and her customer service can’t be beat! By the way – why do I recommend Nutrimills? Nutrimills are the fastest, strongest, and most efficient grain mill. It consistently produces the greatest quality flour. It has a variable high speed which gives a super fine or course flour – whichever you prefer. So basically, I don’t know how I would live without mine. I’ve used my Nutrimill every week for the past 12 years and it is still going strong! They are worth the investment and end up saving you money very quickly as you make your own flour for baked goods! Ready for a chance to win? Enter the Rafflecopter below for a chance! I’ll draw a random winner on Wednesday, November 8, so watch for an email sharing the winner! A huge thanks goes to Paula’s Bread for providing this great giveaway! Thank you for a chance to win a nutrimill. Congratulations on a successful 10 years!! Thanks for the opportunity. Congratulations on 10 years! I’ve always wanted a Nutrimill! Thank you for this opportunity for such a great (and much wanted!) giveaway!!! Freshly ground wheat is the best! I would love to win one! A friend tagged me in this because I was just asking about this last week! Happy 10 years!! I’ve been reading your blog for 8 years . Thank you ! I’ve had some friends that have ground their own over the years, and they all have said this is their #1 pick for a mill! I hadn’t jumped on board yet… Yet… ???? What an awesome give a way!! I have loved using fresh ground flour. How amazing! I’d love to win! Happy 10th Anniversary!! Thank you for the giveaway. I want a Nutri Mill. :-) I bake my own bread all the time and would love to upgrade to this grinder. Having a mill would be a blessing for our family! It’s totally a goal of mine to start grinding my own flour and making my own bread products! Thanks for a chance to win one of these sweet mills! Ooh this would be so awesome to win!!! This would be a huge blessing to us! Thanks, Laura, happy anniversary. My old grinder just died–a new one would be a great help! I would be over the moon if I won! I’ve wanted one for years, but it’s never made it to the top of the list! Would love to try one. Thanks! Awesome giveaway. I have a grain mill attachment to my mixer but it’s on it’s last leg (it’s 25 years old!) and I have to run the rain through twice to get it a decently fine coarseness. I’d love to speed things up a bit with a new mill! This would be awesome to win, thank you!! This would be so amazing. I would love to try out this nutri mill I have friends with this model and love it. I would be very excited to win! What an awesome and generous prize!! Congratulations to 10 years of writing and providing help! I’ve read for a lot of those years and used tons of your recipes. Thank you! I’ve wanted a grain mill for years but have never made it a priority to save for one. This would be amazing to win!! Congrats on 10 years! Happy 10 years!!! I appreciate all the time and work you put into this blog… it’s such a blessing. Would love to win this give away!! Congratulations on your 10 year anniversary! Thanks for the giveaway! I’d love to win this grinder so I can make fresh bread not only for my family but others as well. I’ve been waffling on buying a grain mill for years. I’d love to have the decision taken out of it and win this one! Thank you! I hope I win. I’ve always wanted a Nutrimill! Congrats on 10 years! What a sweet giveaway to help celebrate. I would love to win this Nutrimill. I would LOVE one of these!! I make homemade bread for my family several times a month. Happy 10 year anniversary!! I need this! I have buckets of strategies stacked in my kitchen and my grain mill broke! Excited would be an understatement! I’m so glad that I found your blog. Happy 10 year anniversary!!! Can’t wait to see what is in store next! I’d love to win! This has been on my list for quite some time! I would be so excited to win this Nutrimill!! How generous of Paula!! And happy ten year anniversary! Great giveaway!! We love grinding our own flour and our old nutrimill is slowly giving up the ghost. Thanks for another source to buy one from! I have loved your blog for many years! Congratulations on 10 years! I have always wanted a nutrimill, thank you for the chance to win one! Thank-you Laura and Paula! I would be beyond thrilled to win one of these (and if not, will consider adding to a future gift list). What an excellent give away! I started grinding my own wheat and corn about 2 years ago. I bought a 15-year-old machine (not Nutrimill)…and I’m wondering how much longer it will hold out! I would love to win a Nutrimill for another 15+years of grinding! I would love to win to use for GF grains. Thanks for the chance to win. I’ve always wanted one of these!! Love the idea of grinding my own wheat berries!! I would be so excited if I won! It is my birthday month. What a present this would be!! Thanks for the chance to win and always for all the work that you do with your blog…..
Would love to win a Nutrimill! Been hearing about the fresh ground wheat and how much better it is for baking for years now. Yay for a decade celebration Laura! I must have started reading your blog shortly after you began. Our children are similar ages and i raised them on your recipes, ideas as well as wisdom. Thank you for sharing your journey these last 10 years! Thanks for the opportunity to have this mill. I would love to win and try the Nutrimill! What a generous prize! Thanks for the chance to win. I have been wanting one for years. Nutrilmill Grain Mill I have heard is the very best. Thank you for the giveaway!!! This would be AMAZING! And FYI — totally want to make those chocolate cheesecake muffins. Yum! Thanks for a chance to win this! I would love one. I’d love to win! Thanks for the giveaway, and for all the awesome knowledge you’ve shared over the years! Congratulations on 10 years!! And thank you for the giveaway!!! I LOVE freshly ground grains. So yummy and good for you. I would really like to win this as I grind grain every week for baking bread etc. My mill has seen better days so this would be great to win. Thanks for the chance to win. Never had one. Always wish to had it. Really hope to win it. I will use it a lot. I’ve always prefer making my own bread, and have heard fresh ground flour is even better, I would love to win a mill!! What a fun giveaway! Thank you for the opportunity! Thanks for the giveaway. I have always wanted grinder for bread making. Thank you for all your many years of encouraging mothers in their daily duties! You are such an incredible blessing! I have recently started freezing muffin batter and oh my, my family LOVES having a variety of fresh hot muffins in the morning! Thank you! It would be SO exciting to win this!!! I would be so excited to win the Nutrimill! What a wonderful blessing this would be to win! Thank you so much! I would love this, have been wanting one for a very long time! I’d love to win and start making bread from scratch!! Thanks for the chance!! Would ???? this. Thanks for the entry! I’d love to win this giveaway and start to make bread from scratch!! Thanks for this chance!! Sounds like a wonderful opportunity!! Congratulations on 10 years! We’ve used the Family Grain Mill for that length of time but I’ve always wanted a Nutrimill because the flour is much finer. I’d love a nutrimill! Bern wanting to make healthier bread for my family. I have always been interested in grinding my own flour and would feel healthy knowing exactly what went into my flour. Would love to win this nutrimill. It sounds wonderful! Congrats on 10 years!!! Blessings!!! I’d be thrilled to the moon and back! Congrats on 10 years! Blessings!!! I have always wanted a NutriMill (Grain Mill) I have always wanted to grind my own grains to help not only save my family money but also help with the health of my family. I would love to start grinding my own flour! I would love a Nutrimill! Super excited! Ten years — wow! Congrats on your success! Nothing beats fresh ground wheat! Yay! What a great giveaway! Also, thanks for sharing yourself these last ten years. You have certainly been a blessing to me both as a mother and as a sister in Christ and we have never even met. Maybe someday! I would love to win a mill. I have thinking about getting one for about ten years, but it never seems to be quite high enough priority in the budget. I would LOVE to win one of these! I am taking baby steps to improve my family’s meals, and this would be a giant step in that direction!!! Thank you for offering the giveaway, and for the chance to win! I would be so excited to win one of these! We don’t have a grinder – and until recently weren’t buying many whole grains, but I’ve started keeping some on hand, and am in the process of saving for a grinder… Which kind of put the cart before the horse lol Oh well! Thanks for the chance to win! What a generous giveaway! I would love to have a grain mill to help fuel my family with healthy food. I have had my Nutrimill for around 12 years also, and it is almost dead I think. I would love to win a replacement! 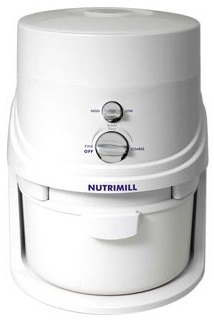 I’ve recently been learning a lot of food and nutrition as I try to feed our growing family on homemade foods and would love to add the Nutrimill to my kitchen to make it easier to have fresh, nutritious whole grain flour.Hand mills take forever….I’ve found ;) Crossing my fingers!! I would LOVE to have a nutrimill! We go through so much flour at home and being able to grind my own would be amazing! I would love to win this Nutrimill and continue the bread journey,???? Thank you for offering this giveaway, Laura! I love your blog and have been reading it almost the entire 10 years — I found it only a few months after you started it. Congrats on blogging for 10 years and sharing so many recipes with us! Would love to make my own GF flours. Thank you for such an awesome giveaway!! And congrats on the 10 year blogaversary!! I have been excited to find a whole grain sourdough recipe that my family loves, and I’m finally achieving the goal of baking our own bread weekly. I’m using a used mill I bought from a friend and I don’t know how long it will keep going, so a Nutrimill would be great! This would be an awesome thing to win. Love fresh bread. happy 10 years! we would love to win a nutrimill! mmmm. fresh! I have been buying fresh ground flour and cornmeal from a friend. It would be so nice to be able to grind my own when I need it. I would be very excited to own this grain mill. I like how many different grains it grinds and the different speeds. I want this so bad to grind sprouted berries and great flour to make sourdough bread. Hopefully my family can handle it after being off it for two months now. Congratulations on 10 years! You are the first blog I started reading and have enjoyed Heavenly Homemakers! Thanks for the chance to win. Congratulations, again! This would be awesome. Would love to win! Thank you for the chance to win this Nutrimill! I have loved my nutrimill. My husband cleaned ours and the on/off switch broke. Wondering if I can get it replaced. Otherwise I love it! I would love to win the Nutrimill. I have been drooling over this one!!! Nothing better than fresh bread. Thank you for the chance to win. What a fantastic giveaway!!! I have wanted a grain mill for a long time! I would love to have fresh flour. Congratulations on your 10th anniversary! Thank you for the chance! Wow! What an awesome opportunity. Thank you! I’ve wanted to try one for a couple of years now but couldn’t justify the cost. I’d love to have one. I would be SUPER excited! A Nutrimill has been on m y wish list for a couple of years now. I would be SUPER excited! A Nutrimill has been on m y wish list for a couple of years now. I love making homemade bread! I would love to win one to make my breads and baked goods taste even better! This would be great! I would love to be able to mill my own bean flours! Thank you for such a wonderful giveaway!!! I have wanted one of these for a long time!! I would love to get the chance to use it!! I have heard that grinding your own flour makes the absolute best bread! I would love to win this! Thank you for this giveaway! And Congraulations on 10 years!! Congratulations on 10 years! ???? What a great way to celebrate! I’ve been eyeing Nutrimills for a few years. Would love to own one!! I love to bake…a Nutrimill Grain Mill would be a huge help! Happy Anniversary! This would be so awesome to win! Many blessings to you, Laura, and congratulations on 10 years!!! Your heart is beautiful and your humor is so great and encouraging–may God bless you! This would be so great to win for my family! We are definitely keeping our fingers crossed. We’d love to make some homemade bread from home -ground flour! Thanks for the opportunity! So awesome!!! Thanks for the opportunity!! I would love to the nutrimill. This Nutrimill would definitely add a new and fun dimension to my baking! Exciting! This would be so fantastic to win!!! I have been making all our bread for years and would love to up my game! Congrats on 10 years! I would love to win! I’m so excited about the Nutrimill! Thank you for sharing about grain milling and offering this give away. I’ve added this machine to my wish list so I can boost the nutrition level of my bread. My mom used to do this! Thanks for the giveaway! Thank you so much for this chance to win! I really want one of these, but just haven’t been able to get one yet. Congrats on 10 years! I’ve been using your recipes for close to 5 years and really appreciate all you do!! There’s nothing like freshly ground wheat! Thank you for this wonderful give away. I’ve read your blog for 7-8 years now (you’ve outlasted my old email account!!) and have wanted a grain mill every time you mention how wonderful yours is. Like someone earlier stated–it hasn’t made it up the list yet to being a top priority. I’d love to have one, but it seems there are always more pressing needs. Blessings on you and your family and if the Lord tarries, may there be many more years of Heavenly Homemakers. I would absolutely love to win a Nutrimill and grind my own grain! Thank you, Paula and Laura for this chance! Thanks so much for the giveaway. i would love to win this . I love your site . So refreshing . Thank you for the opportunity to win! Congrats! Wow, great giveaway! If be thrilled to win this mill, I’ve wanted to try grinding my own flour … love baking, and ready to take it to the next, and healthier, level! I’ve been contemplating getting one of these for years! I think this is the year I add it to my Christmas list! Thanks for a chance to win! I would LOVE to win a Nutrimill and you’re giving it away on my birthday, how awesome would that be?!!! What an amazing prize! yay for fresh grains! What a great giveaway and such a blessing to the winner! I’ve been wanting a Nutrimill since I first saw you write about them years ago, but we are on a very tight budget. This would be perfect! I would be SOOO excited to win! I was just looking at grain mills to put on my Christmas list and was a little overwhelmed at both the price and the options. I found your site not long ago and absolutely love it! I’m excited about this giveaway. How generous! This will most definitely be a blessing to the winner. :). I have tried grinding wheat in my vitamix, but it’s too course. I would love to own a nutrimill! this would be awesome to win, I love making all my own stuff from yogurt, to bread, to detergent, grinding my own flour would just be awesome! I’ve looked at getting one of these so many times. My budget has just not allowed it. It would be soooo great to win one!! This would be amazing to win. A huge blessing for our large family! I would LOVE to win! I buy prairie gold flour online from Walmart. This would be awesome to have! I so need one! I would love to win this! I would love to try a nutramill! I have an old dinosaur magic mill that doesn’t grind very fine. Thank you so much Paula for doing this giveaway! Crossing my fingers! I’ve been wanting a grain mill for so long!! I want to purchase local organic grain and mill it for sourdough!! Thanks! Thank you so much for offering this give away! I’d love to win! Thank you for the great giveaway Laura. I’ve been enjoying your blog since it started, 10 years ago. Back then I was a newly wed about to celebrate our two year anniversary and expecting our first child. Now I’m a homeschooling mom of three and I am so thankfull for having you as a role model this whole time. Bless you for taking your time to help us with raising our families and strengthening our marriages. It’s been ten years of pure benefit for us all. Thank you and keep on trucking! I never win anything, but a Nutrimill would be a dream come true, so I just have to try! I currently use the Whispermill and it is going strong, but I have had it for more than 10 years and it would be great to have a new one and give my current one to a friend that is interested in grinding her own grains! I would love to win from Paula’s bread! Love her name too! Wow—this would be an amazing thing to win! I would be thrilled! And not only for grains–the description also mentions grinding beans, rice, corn! This would take my kitchen to a whole new level! I’d love to win this, my friends rave about fresh ground flour at home and I want some too! I miss having a grain mill, this would be great!!! Congratulations on 10 years of blogging. Thanks for the opportunity to win a Nutrimill. Thank you for the opportunity to win a Nutrimill, I Have wanted to try fresh ground flour for some time now!! Wow!!! It would be amazing to win one!!! thank you so much for sharing this giveaway! we’ve been having friends mill our flour for us for several yrs., so it would be delightful to remove that responsibility from them. I have a 25-lb bag of beautiful wheat all set to go; all I need is a mill! I bought the wheat thinking buying a mill would be no big deal until I saw the prices, and somehow boilers and broken cars and braces and new roofs keep getting in the way of things that really are not necessary but would totally make my day. Would love to win this! Love your blog, too; you always make my day. Congrats on 10 years! Our family loves fresh bread! Love your blog! Thanks for the chance to win! This would be an awesome addition to my kitchen! Congrats on the 10th anniversary and thanks so much for the chance to win this amazing giveaway!!! Congratulations on 10 years! I would love to win the Nutrimill. Great giveaway! Happy 10 years! I used to grind my wheat and made homemade bread every few days. Then our youngest son was determined to be gluten intolerant as well as a few others in our family . We very sadly gave away our milk and bread making items to a friend with a large family. Fast forward 3 years and after doing research after research I figured out that they aren’t allergic to gluten at all – they’re allergic to the pesticides used on wheat . So we cautiously integrated only organic wheat back into our diets after being gluten free for those 3 years and we haven’t had any problems! It’s been 3 years now on an organic wheat diet! I still haven’t bought a mill but I’m making my own bread again! Thank you for the chance to win this! I use so many of your recipes and love your blog posts! Happy 10th Laura! Your blog has been a blessing to our family! Would love to win a NutriMill!! I love your website and have followed you for many years. Thanks for a chance to win the nutrimill! I would LOVE to win this!!! Thank you !! Would love to win this to make your stir and pour bread with fresh ground flour! It would be such a blessing to win. Having fresh ground flour to bake with………….wonderful!! I cannot convey my excitement in words! I have wanted a nutrimill for years, ever since I learned about them in maybe 2004. Thank you for this giveaway! We would love to be able to have one of these at our house! My mom used to grind her own flour in her hippie days. ???? I’m not a hippie, but I would love to be able to grind flour too! Congratulations on 10 years! I would love a NutriMill. I started on the fresh grain train a few years ago with using a KitchenAid, but I’m not a fan of the texture. I have a Nutimill & love it. I’d love to win one to give my mom for Christmas! A grain mill is something I’ve wanted for several years but it won’t be in the budget anytime soon so I would love to win one! I would LOVE making homemade bread again! I grew up making it but now that I’m married I’ve only made it a handful of times as I don’t have a mixer now. I’d be so excited to have a grain mill to begin my collection of bread making supplies!! This would be totally awesome to win!! I would love to win this! Thank you for the opportunity! God bless! I am so excited I love your blog and have implemented so many things into my life and hope to start grinding my own wheat! 10 years! Way to go. I bought a Bosch from Paula a few years ago and I love it. The Nutrimill has been on my wish list ever since. Wow, ten years! Congratulations! It would be very exciting to win this nutrimill, as I think about purchasing one all the time, but since I’m not sure I’d use it regularly, I have a hard time justifying the cost. Happy Anniversary. Thanks so much for the giveaway. Thanks for the chance to win this! Your blog was the first one I ever started to follow. I can’t tell you how many of your recipes have become staples in our house! Congratulations on 10 years! Oh my goodness. If I won this you’d probably hear me scream from all the way in Oklahoma. A grinder is definitely on my want to own list!!!! This would be super awesome! Thanks for the giveaway! I would love to have a Nutrimill! The next step to better nutrition in my families meals! Thank you so much for the opportunity and congrats on 10 Years!! That would be wonderful! Thank you for all the years you’ve been a part of my day. Each day when I check my email I know that I will most always have an email from you. I hear from you more than family, :-) which makes you feel like part of my family. God bless you. You are an important contribution to God’s family. You keep us anchored to what’s important and encourage us. As this busy world pulls at us from all directions you continue to point us to our Creator and Savior. Thank you. Thank you for offering such an awesome prize. This is such a great chance to win something I have been wanting to purchase for my family. Congrats in 10 years! I’ve been looking at getting this exact mill! It’s such an investment that I haven’t pulled the trigger yet. I would use this heavily if I won. I have loved your site and recipes for years now. Thank you! I always get super excited when you have this giveaway. I have followed Paula’s Bread for years! She shares lots of tips on bread making as well as great recipes! What a great giveaway!! Thanks for the chance to win such an awesome priz! I would be super excited to win! 10 years – how wonderful! Congratulations and thank you for this fantastic opportunity!! This is a wonderful give-a-way! I would love to win a new grain mill since the one Im now using is over 25 years old and may be on its last leg. It has helped me feed my family many loaves of healthy whole wheat bread. Congratulations on 10 years! That’s quite an accomplishment. And thank you to you and Paula for being generous to hold this giveaway. Someone will be very lucky, indeed. You both seem like gems???? i would love to have a mill to make fresh flour for bread. Congratulations on 10 years! I love your blog! Thanks for the opportunity to win a Nutramill. What a nice way to celebrate 10 years! Thank you so much!!! Would love to win this amazing product! Thank you for the chance to win!! them often. I would love to win this mill. I would be so excited to win this!!! I am so excited about this giveaway! Thanks! What a blessing this would be!?? It would be so exciting to win a nutrimill! Thank you Laura and Paula for a chance to win! I would love to try grinding my own grains! Thanks for the opportunity to win! This is something I have wanted a long time! Thank you for the chance to win the nutrimill !!! Both you and Paula are amazing and have blessed my homemaking/motherhood journey for nearly nine years now! I would love to win this! I’ve been wanting one for a long time! Congratulations on 10 years! Have wanted one of these for a long time! Thanks for the giveaway! Thank for the opportunity to win a new grain mill! I’m literally on the edge of my seat waiting to hear the winner! Oh no, I missed my chance!! I have been wanting to give milling my own flours a try and see what it does for my baking!! As it is we don’t have this kinda money, but maybe one day!